Warranty: 2 years for boiler, 1 year for feeding screw and all other parts. McLaughlin's Golden Glow Boilers are designed for use in all domestic central heating installations. 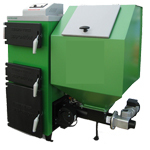 All sizes can be covered with a full range of boilers available. Home heating, pubs, hotels and industrial units that need heat can install a Golden Glow Boiler. They have automatic feeding systems, which are electronically controlled to ensure the most fuel efficient system on the market. - possible to use in conjunction with a buffer tank. The boiler is equipped with a thermostatic safety valve.